My old school chopper has a Wyatt Gatling 6 over springer on a Santee 4 up and 2 outframe softail frame thats been converted to a mechanical rear brake. 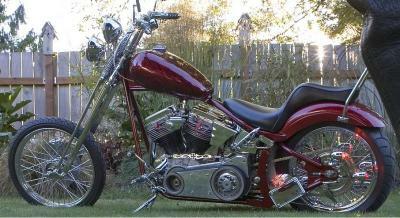 Panhead 88CID, and an 18 inch Blackbike rear 200 wheel. You've done a fantastic job, Jackson! Your pan reminds me of the choppers I used to see running the highways back in the sixties. From the dual headlights, long springer to the king and Queen seat...pure old school. I love it!